Authors: Chowhan, S., Haider, M. R., Hasan, A. F. M. F., Hoque, M. I., Kamruzzaman, M. and Gupta, R.
Abstract:An experiment was conducted at microbiology laboratory of Bangabandhu Sheikh Mujibur Rahman Agricultural University to control the bacterial soft rot of fruits with chemicals in vitro and in vivo condition in 2013. Soft rotted fruit samples of mango, apple, banana, papaya and pineapple were collected from different areas of Bangladesh based on characteristic soft rot symptom. After performing biochemical and physiological tests for characterization of bacterial isolates isolated from fruit samples, three bacteria species namely, Erwinia carotovora subsp. carotovora, Dickeya dadantii, Pseudomonas marginalis were identified. Antibacterial activity of vinegar, boric acid, calcium chloride and potassium sulfate were evaluated against soft rot bacteria. Among these chemicals, vinegar and boric acid showed antibacterial activity against soft rot bacteria in vitro. Based on the results of the in vitro experiment, vinegar and boric acid were used to control soft rot disease of papaya and apple in storage. Vinegar was found more effective than boric acid in controlling the soft rot disease of fruits in storage. Himel, R. M., Khan, A. A. and Reza, M. E. (2017). Effect of some chemicals against bacterial soft rot of fruits. Journal of Bioscience and Agriculture Research, 13(01), 1087-1091. Himel, R. M., Khan, A. A. and Reza, M. E. “Effect of some chemicals against bacterial soft rot of fruits”. Journal of Bioscience and Agriculture Research, 13.01(2017): 1087-1091. Himel, R. M., Khan, A. A. and Reza, M. E. “Effect of some chemicals against bacterial soft rot of fruits”. 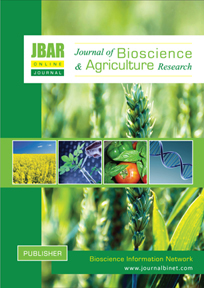 Journal of Bioscience and Agriculture Research,13 no.01(2017): 1087-1091. Authors: Mehraj, H. and Shimasaki, K.
Authors: Khan, S., Shah, M. A., Wahid, M. A., Rasool, A. and Khan, M.
Authors: Raushon, N. A., Riar, M. G. S., Sonia, Sku., Mondal, R. P. and Haq, M. S.
Abstract: The present investigation was concerned with the fish biodiversity of old Brahmaputra River under Mymensingh district of Bangladesh. Objectives of the study were to determine biodiversity and abundance of fish, and to assess seasonal abundance and variation of fish in the river. A semi-structured questionnaire was used to collect the pertinent information from 40 randomly selected fishermen from the study area. A total of 55 species of fish and shell fish were recorded from study sites. Among them, 8 species of carps, 4 species of snakeheads, 8 species of perches, 3 species of eels, 13 catfishes, 8 species of barbs, 2 species of minnows and clupeid species, 3 species of shrimp and other miscellaneous 4 species. It was found that 13 species were abundant, 19 were common, 14 species were less common, and 9 species were rare. The fishermen and other local elites reported that fish population in the old Brahmaputra River has been declining very fast over the last decades may be due to change in water current, depth of water, over fishing, temperature etc. Raushon, N. A., Riar, M. G. S., Sonia, Sku., Mondal, R. P. and Haq, M. S. (2017). Fish biodiversity of the old Brahmaputra river, Mymensingh. Journal of Bioscience and Agriculture Research,13(01), 1109-1115. Raushon, N. A., Riar, M. G. S., Sonia, Sku., Mondal, R. P. and Haq, M. S. “Fish biodiversity of the old Brahmaputra river, Mymensingh”. Journal of Bioscience and Agriculture Research, 13.01(2017), 1109-1115. Raushon, N. A., Riar, M. G. S., Sonia, Sku., Mondal, R. P. and Haq, M. S. “Fish biodiversity of the old Brahmaputra river, Mymensingh”. Journal of Bioscience and Agriculture Research, 13. no. 01(2017), 1109-1115. Authors: Majumder, L., Riar, M. G. S., Raushon, N. A., Sonia, Sku and Mondal, R. P.
Abstract: The study was conducted to observe the biodiversity of Shorupdah Beel, fish species, non-piscine animal species and the aquatic vegetation. This beel riches with its biodiversity and most of them are consume by the people of surrounding area. This water body not so deep compare with its biodiversity, highest 5-6 feet in rainy season. A total fifty two species belong to ninteen families under nine orders were identified non-piscine biodiversity of Shorupdah Beel comprises five species of prawns, four species of mollusks, three species of arthropods, two species of amphibians and two species of reptiles. Only fish and prawn are consumed by local people and the highest catch found just after rainy season that is during August and September. Ten species of aquatic vegetation found in this beel. Among these some are edible and some are not. Fishermen and local people said that biodiversity has been declining very fast over the last decades due to change of water depth, over fishing, temperature, use of chemicals in agriculture etc. Majumder, L., Riar, M. G. S., Raushon, N. A., Sonia, Sku and Mondal, R. P. (2017). Biodiversity of shorupdah beel, Manirumpur, Jessore. Journal of Bioscience and Agriculture Research,13(02), 1116-1121. Majumder, L., Riar, M. G. S., Raushon, N. A., Sonia, Sku and Mondal, R. P. “Biodiversity of shorupdah beel, Manirumpur, Jessore”. Journal of Bioscience and Agriculture Research, 13.02(2017), 1116-1121. Majumder, L., Riar, M. G. S., Raushon, N. A., Sonia, Sku and Mondal, R. P. “Biodiversity of shorupdah beel, Manirumpur, Jessore”. Journal of Bioscience and Agriculture Research, 13. no. 02(2017), 1116-1121. Authors: Mehmood, A., Iqbal, Z., Fatima, N. and Qureshi, M. S.
Abstract: Mosquitoes are the vector of many serious diseases of human. They belong to order Diptera, super family is Culicidae and subfamilies are Culicinae, Anophilinae and Toxorhincitinae. Adult male feed on nectar while female on blood except the members of family Toxorhrincitinae. Females are in a habit of laying eggs near water, in water or onto the water. This water may be present in tires, ponds, polythene bags, tree holes, earthen pots and different catchment areas. Tree holes become filled with water, after it rains. Some of this vaporizes while the left over becomes a good place for mosquitoes to lay eggs. Mostly Aedes spp. lay their eggs in tree hole standing water. These tree holes are the habitat of many other immature of insects, which are later on consumed by the larvae of mosquitoes. The larvae were collected from here with pipette and transferred to the lab for rearing and experimentation. Different chemical insecticides are in use for controlling mosquitoes, but there are many side effects with chemical use like resurgence and resistance in pest, mammalian toxicity and non-specific killing action. Soft twigs, leaves, seeds and fruit peel were taken from different medicinal plants, including Citrus reticulate, Citrus maxima, Calotropis gigantis, Citrus limetta, Jasminum officinale, Gardania augusta, Nicotiana tabacum, Citrullus colocynthis, Mentha piperata for the preparation of extracts through soxhlet apparatus, which were then applied on 3rd and 4th larval instars of mosquitoes and efficiency of extracts was recorded in term of percentage mortality and LC 50. The highest mortality percentage mortality (100%) was given by Citrus limetta, Citrullus colocynthes and Citrus reticulate extracts. The lowest LC 50 (207.182 ppm) was shown by Mentha piperata extract.These results indicate that it is better and effective to control mosquitoes by using botanicals instead of chemicals. Mehmood, A., Iqbal, Z., Fatima, N. and Qureshi, M. S. (2017). Efficacy of plant extracts against the tree hole breeding mosquitoes. Journal of Bioscience and Agriculture Research,13(02), 1130-1139. Mehmood, A., Iqbal, Z., Fatima, N. and Qureshi, M. S. “Efficacy of plant extracts against the tree hole breeding mosquitoes”. Journal of Bioscience and Agriculture Research, 13.02(2017), 1130-1139. Mehmood, A., Iqbal, Z., Fatima, N. and Qureshi, M. S. “Efficacy of plant extracts against the tree hole breeding mosquitoes”. Journal of Bioscience and Agriculture Research, 13. no. 02(2017), 1130-1139. Abstract: To assess and compare the effect of different dhaincha accessions on soil health and grain yield of rice, nine dhaincha accessions were used as experimental materials along with a control (without dhaincha plant). The experiment was laid out in a randomized complete block design with three replications. Seeds of dhaincha accessions were sown in experimental plot @ 60 kg/ha. The 45 days old dhaincha plants were mixed up with soil. Soil samples were collected before sowing and after decomposition of dhaincha biomass and analyzed following standard procedure. There is a substantial increase in soil organic matter (up to 26%) and total nitrogen content (up to 25%) in soil after dhaincha incorporation. Thirty five days old, healthy rice seedlings were transplanted in the dhaincha incorporated plots at the spacing of 15cm X 25cm (plant-plant X row-row). The standard rice cultivation procedure was followed. Due to the incorporation of dhaincha biomass in soil, the grain yield was increased (up to 39%) compared to the control. Among the dhaincha accessions, number 95 showed the best performance in terms of grain yield. However, it is too early to make a conclusive remark based on only these very few number of dhaincha accessions. Therefore, a detailed study with a large number of germplasm collected from whole Bangladesh is obviously needed to reach in a precise conclusion. ​Sarwar, A. K. M. Golam., Hossain, S. M. Z. and Chanda, S. C. (2017). Effect of Dhaincha accessions on soil health and grain yield of rice. Journal of Bioscience and Agriculture Research, 13(02), 1140-1145. ​Sarwar, A. K. M. Golam., Hossain, S. M. Z. and Chanda, S. C. "Effect of Dhaincha accessions on soil health and grain yield of rice". Journal of Bioscience and Agriculture Research, 13.02(2017), 1140-1145. ​Sarwar, A. K. M. Golam., Hossain, S. M. Z. and Chanda, S. C. "Effect of Dhaincha accessions on soil health and grain yield of rice". Journal of Bioscience and Agriculture Research, 13. no.02(2017), 1140-1145. Abstract: The experiment was carried out at the research orchard of Horticulture Research Centre, Regional Agricultural Research Station, Hathazari, Chittagong to determine the influence of organic manure with the recommended inorganic fertilizers on the growth and yield of BARI Malta 1. Six treatments, i. e., consisting of organic manures along with recommended inorganic fertilizers, were used. Results revealed that application of mixed organic manure consisting of 10kg cowdung with 10kg poultry manure or 1 kg mustered oilcake with recommended fertilizers significantly influenced the fruit bearing and yield of fruits and produced 100% and 87% higher yield than only cowdung with recommended inorganic fertilizer and recommended inorganic fertilizers alone. This treatment also showed better plant growth and quality fruit production as indicated by plant height, canopy spread and the highest TSS content (8%) in the harvested fruits. ​Islam, M. R., Ona, A. F., Dhar, M. and Amin, M. (2017). Influence of organic manures with recommended inorganic fertilizers on yield of sweet orange (Bari malta 1). Journal of Bioscience and Agriculture Research, 13(02), 1146-1150. Islam, M. R., Ona, A. F., Dhar, M. and Amin, M. “Influence of organic manures with recommended inorganic fertilizers on yield of sweet orange (Bari malta 1)”. Journal of Bioscience and Agriculture Research, 13.02(2017), 1146-1150. ​Islam, M. R., Ona, A. F., Dhar, M. and Amin, M. “Influence of organic manures with recommended inorganic fertilizers on yield of sweet orange (Bari malta 1)”. Journal of Bioscience and Agriculture Research, 13. no. 02(2017), 1146-1150.